The washbasins made of high-quality mineral composite have a convincingly aesthetic and ergonomic design. They satisfy the highest loading capacity and hygiene requirements. They are also designed to be wheelchair accessible. Thus maximum comfort and convenience are provided through an accessible design. HEWI offers two washbasin models whose lengths can be defined individually. The basic design has a fixed depth of 415 mm and a minimum width of 850 mm. The washbasin can be widened to a total length of up to 2800 mm. Asymmetric versions are possible. 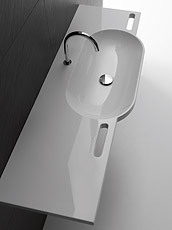 HEWI also offers a washbasin solution with a depth of 550 mm. The models have an oval basin and front-mounted support rails, which can also be used as towel rails. With the tailored washbasins, precisely fitting solutions can be implemented.